I’ve been watching The Bible miniseries with my 8 year old daughter and have enjoyed it much. I won’t quibble with what the producers have done with it. It’s a dramatic adaptation of the biblical narrative, which requires both selectivity and imagine in order to play out the storyline. But as we were watching the last installment of the series, I wondered how this series might affect my daughter who is watching the series with great interest and reverence for God but has never read through the entire Bible. After all, it is always better to have read the primary literature (in this case, the Bible) before turning to the secondary literature. As I thought about it, I realized that what was concerning me was the violence. It’s impossible to tell the story that runs through the Bible without telling of the violence. In this particular case, I was concerned with the affect that the dramatic retelling of what happened to Jesus’ apostles was having on her. I mean, I have visited churches before where I can stop at their cozy book store, trendy coffee shop, and savvy internet cafe, all before checking my children into a state-of-the-art “kid’s zone” Sunday school class and then head off to an awesome worship gathering led by a rockin’ praise band before hearing a message from a hip pastor. Ok. I’ll admit it. I wouldn’t mind having a coffee shop where my church meets and I’m obviously the most hip pastor you will ever meet :-). But in a culture of American Christianity where discipleship appears to be lacking, I wonder if churches have tried to make Christianity so palpable to the American culture that we have lost something vital to our witness. I don’t want to face persecution and I do enjoy praise songs as well as a good cafe mocha on my way to worship. However, as I wondered what affect scenes of persecution would have on my daughter, I wondered whether or not she would want to be a Christian if she knew that she might get killed for it. But I’m not sure she would ever know that she might have to suffer persecution for believing in Jesus from just being a part of some American churches…perhaps even my own. And that says as much about me as it does other Christians. Christianity then was a persecuted faith and Christianity now appears as a sanitized faith. Lord, have mercy on me…on us! This entry was posted in Christian History, Contemporary Culture, Faith. Bookmark the permalink. Thanks for this. I have some general questions as the language of “discipleship” seem to be gaining more and more ground in evangelicalism (which I think is a good thing). But what do we mean by “disciple” and discipleship? And what precludes it – having a coffee shop (we have a coffee bar)? What does discipleship look like for a 21st century American? Should we be physically persecuted, i.e. should we seek it? I’m pretty good at pointing out the deficiencies I see in terms of discipleship, but less savvy at defining what it look like. What do you think? Thanks for the good questions. My short answer to the question of what I mean by discipleship is learning to live in the way of Jesus which I believe requires us to follow him as a learner, learning to believe as Jesus believes and adopt the values that Jesus lives his life by. I have explained this more in the following article I wrote for New Wineskins this past month titled “Living the Way of Jesus” (http://www.wineskins.org/filter.asp?SID=2&fi_key=384&co_key=2718). Ironically, when I was asked to write an article on the issue of discipleship, I wrote this article in response to a tweet or FB comment you made one time in which you observed how everyone is talking about discipleship but nobody seems to be saying what discipleship is. So hopefully my article is a step forward in someone trying to define what discipleship is. As far as how disciples are made, I do think Mike Breen and 3DM ministries have something substantial to say about this in their book Building A Discipling Culture (http://www.amazon.com/Building-Dicipling-Culture-Breen-Cockram/dp/0982452101/ref=sr_1_1?ie=UTF8&qid=1365085942&sr=8-1&keywords=building+a+discipling+culture). In short, disciple making involves the progressive triad of “information ➞ imitation ➞ innovation”. People need the information (i.e., biblical teaching) but they also need a disciple they can participate with in the practice of living the way of Jesus (imitation) and then as they grow, they learn to innovate within their own unique situations. As for seeking out persecution… No! I don’t think we should nor is should this be a requirement or mark of true discipleship. I do think that when we live as disciples of Jesus, being Christian will mean living in ways that are sometimes difficult, outside our comfort zones, etc… And if we are sought out and persecuted then I hope we would have the faith for that. But seeking it out… No. Any ways, I hope that helps answer your questions. Wow! You really said something there bro. The pictures in the middle of the post really tell the story, eh? Thanks for posting this. Very Good Rex! Very much in agreement with you here. Funny, just been reading and meditating on Acts 14:22 this week, where Paul & Barnabas say, “It is through many persecutions that we must enter the kingdom of God.” I’ve been wondering how well we’re doing at entering the kingdom of God. That statement from Acts 14:22 is worth reflecting on for a while. Thanks for mentioning it here. Thanks Mark. It make me reflect on my own ministry efforts and what I am preaching. In light of your post, & the very poignant questions Sean raised on his comments above, unpacking this term “witness” and its meanings is huge to understanding discipleship, I’d say. 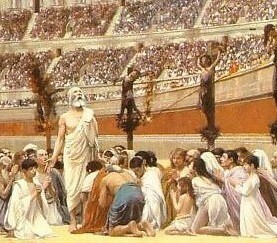 After all, it is the (theological & practical) lynchpin around which Luke writes Acts: just as “witness” is central to the telling of the story, so “witness” is central to how the church lives, thrives, and grows (and of course we understand this to be the work of the Spirit empowering those who are witnesses). So in America, do we find church cultures that prioritize & grapple with living as “witnesses” in American today? I’m going to make a horrible generalization and say that many, many churches don’t know/haven’t known what to do with this idea, much less link it to our call to be disciples. For example, one predominant theme has been to take “witness” & make it a verb that equates it with personal evangelism: telling others how to be “saved”. And of course this opens up a whole other can of worms, because, as some have argued elsewhere, “salvation” has been neutered, has been limited to mental assent – having the right beliefs/doctrine. Believe that Jesus is Lord, and that is sufficient for salvation (tack on baptism to that if you’re C of C). And that is why many churches are where they are at (generally speaking) in America, in a state of irrelevance and decline. I think we have a whole lot of believers, but not many witnesses. It’s easier to simply get the right beliefs down than to let those beliefs change you. For being a witness has a huge component to it of transformation in ethic & praxis. Not just what you believe, not just what you say, but how you live – that testifies to another Kingdom that is breaking into the world. But there’s the rub: that invitation to live in such a way that models another Kingdom ethic – that’s a narrow road, isn’t it? And can I just go ahead and say I’m preaching to myself first here – it easy to play armchair theologian but another thing to consistently live it, to consistently “walk as Jesus did”, as 1 John calls us to. Sorry for the long comment. Thanks Rex for the good thoughts, for challenging me with this too. It’s easy to see your heart & passion for God’s kingdom. Blessings, brother. I’ve never given much thought about the way churches have taken the noun “witnesses” and turned it into a verb that is equated with personal evangelism teaching (polemically?) right beliefs/doctrines. Your on to something with that. Any ways, you are right about “witness” having “a huge component to it of transformation in ethic and praxis” that becomes a very narrow road. It’s easier for me to be a sign on the side of the road pointing the way forward than to travel down that narrow road, leading others with me. Thanks Rex. Regarding big idea of witness, I think that’s what Fitch & Holsclaw are trying to get at in “Prodigal Christianity”. To be a witness ipso facto means to embody the gospel, not just to believe it. To be a witness is mission-oriented, not simply “personal-salvation” oriented. I’m not suggesting a false dichotomy here – you have to believe & buy into that salvation first of course. But being a true witness can’t stop there. Otherwise its selfish salvation, hell insurance, ticket to heaven – whatever you want to call it that we too often reduce it to. But being a witness says, I’m not just saved, I’m changed. And I care about what God wants – for his Kingdom to be made real on earth as in heaven, beginning with me. How am I doing that today as a witness to the kingdom? Second, in light of your illustrations above, I think many churches have drunk deep from the well of self-reliance and result-driven ecclesiology, not mustard-seed ecclesiology. This has roots back to the Great Awakenings, in my opinion. Quantity has always been more of a lure, more impressive, than quality. Quantity is not un-important. But it seems in the economy of the kingdom, quantity will somehow result from quality, if you have faith that God can do that kind of thing.